The Office of Minority Health (OMH) at the U.S. Department of Health and Human Services (HHS) invites you to join us for National Minority Health Month 2018 this April. 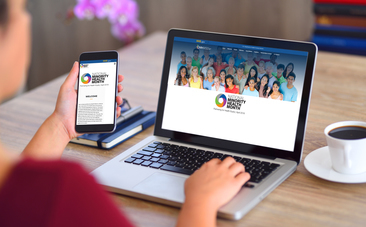 Be sure to visit our website to stay on top of the latest National Minority Health Month news, events and resources. 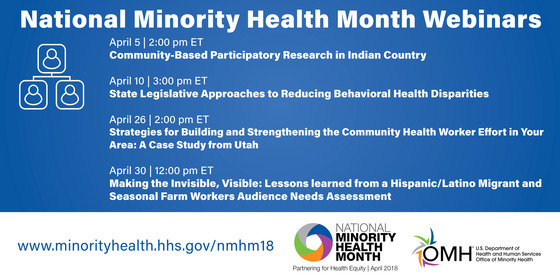 You'll find #NMHM2018 graphics, social media posts and a toolkit with materials and resources in English and in Spanish to use during National Minority Health Month this year. The theme for National Minority Health Month 2018 is "Partnering for Health Equity". Join us in spreading the word about the importance of partnerships to help achieve health equity for all. Learn more here.